Find hotel near Parcanimalier Saint-marti .. It is advised to reach early to enjoy the site at its best as it tends to get crowded later. How popular is Parcanimalier Saint-martin? People normally club together Hotel De Beaumont and Musee De L'eau-de-vie Et Des Vieux Metiers while planning their visit to Parcanimalier Saint-martin. 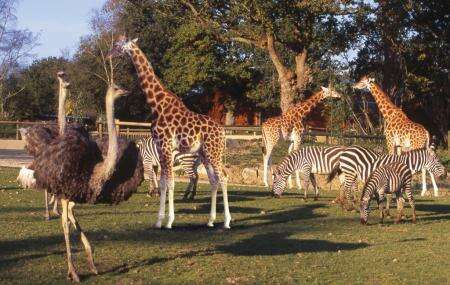 Really fantastic zoo. We took our two year old daughter here for a day out. Wonderful petting zoo, and great range of animals to see. Paddocks for the animals were nice and sized to give good viewing while still giving the creatures enough space. Great setting and nice staff. Our family just had the most wonderful day at Parc Animalier.This was the first time on our trip that not one child moaned or whined once throughout our entire visit. On the contrary, everyone loved it from the moment we walked in. The staff are absolutely fabulous from Lise at the front desk, Gaby who made incredible pancakes, to Aline who was marvellous with all the children having pony rides. The setting was fantastic and the walk throughout the animal areas was really pleasant...everyone enjoyed themselves. The food was all very reasonably priced and very tasty. You never felt you were making a grudge purchase. Highly recommended.